While Minnesota Republicans may be happy with the country's choice of president, they're stinging from defeats at home. Democrats picked up 13 seats in the Minnesota House of Representatives. Two of those DFL wins came in side-by-side districts in north central Minnesota. House districts 4A and 2B include the Red Lake and Leech Lake Indian reservations. 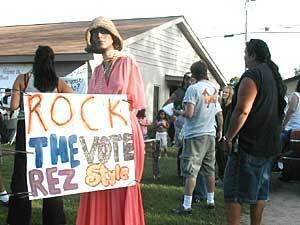 Observers say an aggressive get-out-the-vote effort by Native Americans played a significant role in the DFL victories. Republicans say big money from outside the district also had an effect. Bemidji, Minn. — In the wee hours of election night, it appeared DFLer Brita Sailer was losing her battle to unseat District 2B Republican Doug Lingren. But at around 3 a.m., things changed. "When the precincts from Red Lake came in, that put her over the top," said Donna Whitefeather, an election coordinator for the Red Lake Indian Reservation. "She won." Ninety-two percent of voters in the Red Lake precinct voted for Sailer. In the end, she won by just 247 votes. Organizers in Red Lake say their votes made the difference. Patrick Donnay, political science professor at Bemidji State University, says that's probably true. "I think they've got a good claim to that," said Donnay. "Certainly reservation voters are a key part of the Democratic constituency in these districts. And just looking briefly at the numbers, it looks like turnout in those reservation precincts was up dramatically." Initial tallies from Red Lake show about a 35 percent increase in voter turnout over 2000. The Leech Lake Reservation reports similar numbers. Leech Lake is part of House District 4A. In some precincts there, three-quarters of voters supported DFL candidate Frank Moe. Eva Wilson, who worked on the get-out-the-vote effort, says Native American voters played a big part in Moe's victory. "We had a lot of people that were out in the different communities, giving people rides, making sure their friends and families got to the polls, and just bugging them all day long and making sure people got out and voted," Wilson said. Moe says the Indian vote was important to his victory over three-term Republican Doug Fuller. But Moe also won all five wards in the city of Bemidji. That's something Democrats have been unable to do since the early 1990s. Moe says recent funding cuts in education were a key issue that drove more Democrats to the polls. He says people were angry with how the Republican-controlled House handled the state's huge deficit. "I think those cuts were too deep, and I think that's what voters were registering with their votes in Minnesota," said Moe. Republicans argue the budget cuts were necessary. Bill Batchelder, campaign manager for Republican Doug Fuller, says Republicans paid the price for a legislative session that was largely characterized by gridlock. "It was very, very contentious and the population has spoken," said Batchelder. "The Republicans obviously thought they had the right program. Obviously, the voters have thought differently. And it will be a very, very interesting upcoming two years." Batchelder says money also played a big role. Campaign advertising dollars flowed in from the DFL and Republican caucuses, environmental groups and other special interests. Batchelder estimates more than $300,000 in outside expenditures were spent in District 4A alone. DFLer Frank Moe campaigned that he would work to end partisan political fighting. He says voters across Minnesota sent a clear message that lawmakers need to come back to the political center. "I think there's a middle ground there," said Moe. "And now we have a tighter House, a slight DFL lead in the Senate and a Republican governor. And I think we can now come back to the middle and say, 'All right, what's the best for Minnesota?' I'm optimistic that we'll be able to work together to find that." The DFL winners in Bemidji area districts say they got strong support from Native American voters because they support tribal issues. Both say they'll fight for a proposed Twin Cities casino that would generate revenue not only for tribes in their districts, but also the state of Minnesota. Some observers say Indian gaming will be a key issue in the upcoming legislative session.